"I can confirm it has been found," a spokesperson for Britain's Air Accidents Investigation Branch said. Families of the missing have been notified. The missing plane carrying missing Argentine footballer Emiliano Sala and his pilot has been found, investigators have confirmed. A search boat located the wreckage on the seabed of the English Channel on Sunday. "I can confirm it has been found," a spokesperson for Britain's Air Accidents Investigation Branch said. Sala was flying in the Piper PA-46 Malibu plane after transferring from French team Nantes in a 17 million euro (US$19.3 million) move. It vanished from radar around 20 kilometres (12 miles) north of Guernsey, with pilot Dave Ibbotson the only other person aboard. A privately funded search of the area, led by marine scientist David Mearns, began on Sunday. Mearns, a US-born marine scientist and shipwreck-hunting specialist, announced the discovery on Twitter two weeks after the plane went missing over the English Channel as it flew from France to Wales. “The families of Emiliano Sala and David Ibbotson have been notified by police. The AAIB will be making a statement tomorrow. Tonight our sole thoughts are with the families and friends of Emiliano and David,” he added. “This is about the best result we could have hoped for the families. But tonight they have heard devastating news and in respect of the families I won’t comment any further about what has happened,” Mearns told the Sky News channel. 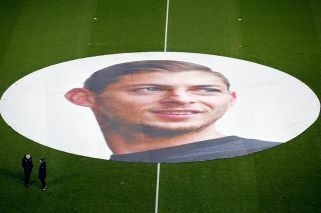 Cardiff paid tribute to Sala as they Bournemouth 2-0 in the English Premier League on an emotional evening in the Welsh capital on Saturday. Bobby Reid's double – a fifth-minute penalty and a clinical finish within 15 seconds of the second-half kick-off – gave Cardiff only a second win in nine league games on a night which was about a lot more than just football. It was Cardiff's first home game since record signing Sala and pilot David Ibbotson went missing. Programme notes, penned by Cardiff owner Vincent Tan and the rest of the Bluebirds' board, said events shook "Cardiff City to its very core" and they were now playing for Sala and Ibbotson. There was a series of tributes before kick-off, with Sala's photograph appearing on the front cover of the match-day programme and the two captains, Sol Bamba and Andrew Surman, laying floral tributes on the halfway line. Sala's name, in the colours of his native Argentina, was also spelled out behind one of the goals as supporters held cards aloft. Cardiff's players, who sported daffodils embroidered on their shirts in Sala's honour, celebrated Reid's first goal by racing to the home dug-out and holding up a blue shirt bearing Sala's photograph.